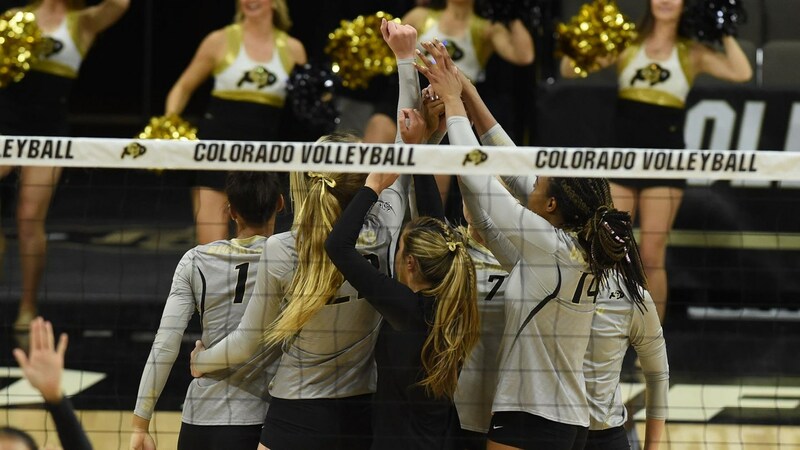 BOULDER, Colo. — The 21st ranked University of Colorado volleyball team will stay on the road for another weekend; this time playing in the Pac-12/Big Ten Challenge in Seattle. The Buffs will face No. 11 Illinois on Friday, August 31, and on Saturday, Sept. 1, CU will take on Iowa. Both contests are set for 6 p.m. starts and will be televised on Pac-12 Networks. Anna Marie Anderson will have the call, while Olympian Holly McPeak will provide the color. Live stats are available here. The Buffs are 2-1 after the first weekend of action, finishing second at the Rumble in the Rockies in Laramie, Wyo. Senior Alexa Smith led the Buffs with 3.50 kills per set. She also added 1.75 digs per set and 0.58 blocks per set. Second for the Buffs was junior Justine Spann, who averaged 3.42 kills and 1.83 digs per set. The Buffs hit .253 at the tournament, thanks in part to sophomore setter Brynna DeLuzio, who handed out 96 assists (8.00 per game). Freshman setter Jenna Ewert added another 21 assists in her first career action. Defensively, the Buffs averaged 2.75 blocks per set. Redshirt freshman Danielle Price posted 1.42 blocks per set and junior Lillie Klemmer added 1.25 blocks per set. Junior libero Rachel Whipple led CU in the back row, averaging 3.25 digs per set. Illinois is 3-0 to start the season and is currently ranked 11th in the latest AVCA Division I Coaches Poll. The Illini swept UNC-Wilmington, but was pushed to five-sets against No. 25 Colorado State and Northern Colorado last weekend. Jacqueline Quade leads the UI attack, averaging 4.54 kills per set while hitting .282. As a team, the Illini hit .243 with Jordyn Poulter handing out 10.69 assists per set. Ashlyn Fleming posted 1.00 blocks per set as the team averaged 2.15. Libero Morgan O’Brien is recording 4.62 digs per set. Iowa is 2-1 after the first weekend. Taylor Louis leads the team with 4.17 kills per set, while Griere Hughes adds 3.00 kills per set. Brie Orr is averaged 8.92 assists per set while leading the Hawkeyes to a .251 hitting efficiency. Amiya Jones is the top blocker, posting 1.00 blocks per set and Ore adds an additional 0.92 blocks per set. Molly Kelly is recording 5.00 digs per set. The Buffs will open up their home schedule, Sept. 7-8, with the Buffs Invitational at the CU Events Center. CU will host Georgia, North Carolina and Oklahoma.